Guests may drive along the auto trail during a KwaZulu-Natal safari holiday, or join a guided safari to special areas within Ndumo Game Reserve including some of the pristine pans, where a vast array of flora species can be seen. On a KwaZulu-Natal safari holiday at Ndumo, visitors can explore the reserve in their own vehicle on an auto trail or enjoy exclusive guided open 4x4 game drives and day walks. Bird-watching is a top activity at Ndumo Game Reserve and the expert field guides are specialists at tracking down an illusive bird from avid birders lists. Guided day walks to the Pongola River pass through patches of sand forest, grasslands and riverine forest. These walks will reward guests with sightings of elusive Marsh species such as Dwarf Bittern, Rufous-bellied Heron, African and Baillon's Crake, Allen's Gallinule, Lesser Moorhen and the Greater Painted-snipe. The wetlands of Ndumo Game Reserve are Ramsar sites (of international importance). Visits to the Nyamithi Pan reward guests with breathtaking views of the surrounding scenic landscapes and great photographic opportunities. On bush walks, guests will also see a fascinating array of insects in the reserve. A variety of big game can be seen on a KwaZulu-Natal safari holiday at Ndumo, including White Rhino, Buffalo, Hippo and plenty of Crocodile. 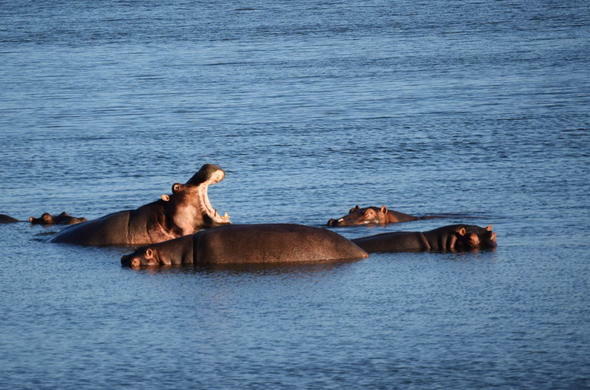 Ndumo Game Reserve is located in a most interesting and diverse area in South Africa. Within an hour’s drive, visitors can move from bushveld and big game country through sand forest and coastal dune forests to rocky shores. Guests can snorkel and dive at Kosi Bay, explore the unique fish kraals of the local people as well as discover the incredible swamp forest and Kosi Palm forest with its rare Palm-nut Vulture. Birding walks at this KwaZulu-Natal nature reserve in South Africa are led by extremely knowledgeable guides. Birds can be seen from anywhere within the Ndumo Game Reserve.